Say goodbye to the aging and fading floors you have been living with for too long when you make an investment in our tile flooring in Charlottetown, PE. Whether you are remodeling a home you have lived in for years, or decorating an office vestibule for the first time, our competitive pricing on tile floors is just too good to pass up. Find a match for any type of design plan you have in mind when you visit our expansive showroom for a consultation. Getting the best fit for your flooring purchase begins with accurate measurements and a clear estimate of the costs involved with every stage of your project. We provide you with attentive service when you visit our showroom, and results-driven installation services at your home or office. Natural tile made from porcelain and ceramic has been sought-after by discerning designers and architects for centuries, and both are now available at our showroom at a significant savings to the customer. Enhance the value and appeal of your home, and make it more attractive to potential buyers when you purchase slate and stone tile from our store. The buying power of the Flooring Canada name gives you an advantage when you are planning your next home remodeling project. We are able to carry some of the most valued names in the flooring business, at prices you can afford. This lasting option for home flooring is sure to serve you well for years to come, so make the smart choice and visit our showroom as soon as you can. Instead of settling for the substandard flooring that others offer, take advantage of what our store has to offer. We provide you with reliable support from the moment you step through our door until the final tile has been secured. Get the answers to all of your design questions, and identify the type of tile that works best for your particular project. Whether your plan calls for a sleek and modern look, or an approach that focuses on texture and character, our selection has something for you. Choose from a broad array of options that include many of the major manufacturers you have come to know and love. Our 5-Star rating system gives you a greater level of control and protection as a consumer. Review the flooring from proven brands like Daltile, Elegant, Olympia, and Casa Roma, and choose the tile that fits your budget best. Eliminate the guesswork involved with tile floor installation and save a great deal of time and money in the process. Our team of experienced contractors is equipped with the advanced tools needed to install natural slate and ceramic in your unique living space. There is a serious difference between installing ceramic tile flooring and carpet flooring, so it makes sense to hire a team with the right tools for the job. Learn more about the creative opportunities that become possible when you decorate your floors and walls with tile made from ceramic. 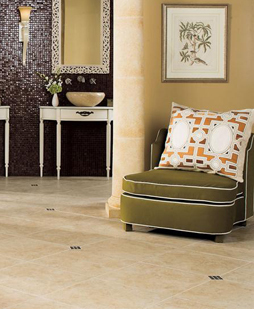 Contact us today for the tile flooring you need to take your home interior to the next level. We proudly serve customers in Charlottetown, Summerside, Souris, Kellys Cross, and Brackley, Prince Edward Island.